You have just landed at an airport you've never been to. Your flight was delayed and now you are running a late. As you hurry up the jetway and into the terminal, you anxiously look up for one thing and one thing only. The exit sign. You want to know the quickest way out of there. Intuitively you knew where to look and what to expect: "Exit", or "Baggage", or "Ground Transportation" and, of course, an arrow. Maybe it doesn't even have any words, just a silhouette of a suitcase and an arrow pointing to the right (you thought it was to the left, but you trust the sign). Have you ever wondered how the sign got there, placed just so? Or why it's school-bus-yellow with black lettering. And why the type is Helvetica and not Times Roman, and in lower case and not all caps? It probably never even occurred to you. That is about to change. Signage is only one field of design (it's officially called "wayfinding"), but there all kinds of design, from industrial design (the design of physical objects), architecture (design of space), UI design (user interfaces, like in the apps on your smart phone), landscaping (outdoor space), graphic design (two-dimensional objects), even things like event planning and advertising. Designers and their designs do all the things you'd expect: create order, make things easier, communicate, shape, direct, persuade, inform, and beautify. But that's the obvious stuff. What I wanted to discover was the irreducible purpose of design. I found it, but you'll have to wait a minute. When I hung out my shingle nearly 40 years ago, I wasn't real philosophical about the work—I took on whatever I could find and got it done. However, like any maturing professional, I started to question what I was doing and why. I didn’t doubt what I was doing, but I wanted to understand what my purpose was. Because my roots were in fine art, I felt the answer might lie in exploring the difference between design and fine art, and what makes each a success or failure. Here's what I found (fine artists, brace yourselves): 1) fine art elicits awe, design changes behavior, and 2) depending on the type of design, if it doesn't change it behavior it fails; but because of the subjective nature of fine art, if a work of art doesn't inspire awe in one person it still might in another. In other words, the demands on design, as far as purpose goes, are greater. Sure, design uses the same principles of art as the painter, it can beautiful and awe-inspiring, but if it doesn't change behavior then it fails or we chalk it up as art. Not all design is that easy to judge. I can design a beautiful poster promoting an opera, but if the reader doesn't like opera, or the dates don't fit it into their calendar, no amount of good design will change their behavior. 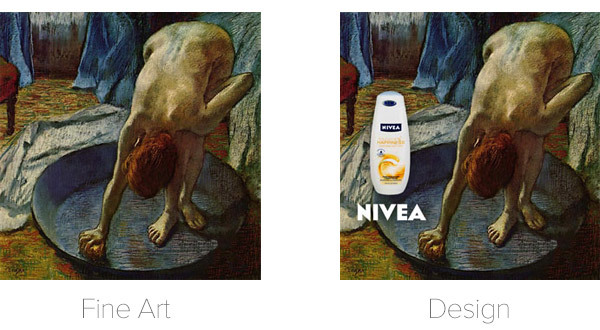 So, we somethings have to judge the success of persuasive design on pure aesthetics, and note that the designer didn't do anything to detract from the viewer's final behavior. The criteria for something like UI design is stricter: if I can't figure out how to use my application or device then the design fails. My need or ability to use it is not subjective, it is egalitarian—everyone who has this device or these apps should be able to use it. The more objective the problem is, the more pressure on the designer to get it right. And not everything we call design is really design: jewelry design, for example. Why not? First, it calls attention to itself, and secondly it doesn't have to change any behavior (unless it's a wedding ring)—it's just pretty adornment. Designers have to get over the idea that their work is never to purposely draw attention to itself: the signs in the airport, the switches on your hair dryer, the buttons in the elevator, the layout of your kid's school, the arm rest of your office chair, the typography of the book you are reading, or the dress you're are wearing to your daughter's wedding (though in that case you want it to draw attention). Ironically, because it doesn't work, it's the bad design that gets noticed. Fine art is different: it calls out for attention, it "performs" to the eyes or ears of its public. If not, it becomes the cheap paintings in your hotel room or the music in the elevator. We encounter design everyday, from when we roll out of the sack until we climb back in 16 hours later. Good design, bad design, design that works cleverly in the background, and bad design that makes our day ugly or difficult. Design that is making your hair dryer easier to hold, a website that is more intuitive to navigate, or your newspaper more enjoyable to read. Designers all over the globe head to work every day to make stuff that should be pleasant to look at, but ultimately changes behavior—even for the fine artist walking up the jetway at that unfamiliar airport. 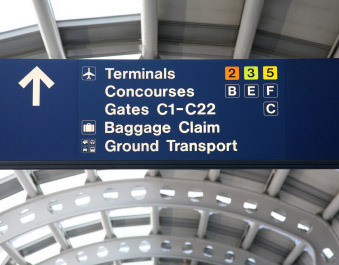 Next time you get off a plane, look for that sign and thank the folks that thought it should be there—changing your behavior.